The aim of our racking inspection courses are to give delegates knowledge of pallet racking systems and how to keep them safe through the procedure of inspections and risk assessments in conformity with all relevant SEMA guidelines, EN standards and current health and safety legislation. Pallet racking inspections are integral to the on going safety of the pallet racking on your site and the fact that you have trained staff on-site to assess and report damage is of extreme importance. We are thrilled to offer a wide range of courses that can accommodate new members of staff or even the most experienced racking inspectors. 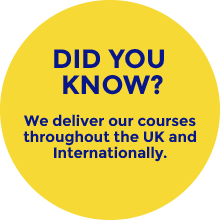 All our courses are written in accordance with the European EN 15635 Standard leaving you safe in knowledge that your staff are receiving the most up to date and thorough information possible. Click the titles below to find out more on our Pallet Racking Inspection Courses.. This course covers 7 detailed modules highlighting all the essential aspects of pallet racking safety including the components, system types, common hazards and the relevant legal requirements. This is a two-day course with a mix of theory and practical. This course is aimed at those identified as being able to take on the role of in-house racking inspector as well as those with responsibility for warehouse health & safety. Suitable roles would include health & safety advisors, warehouse supervisors etc. Delegates will gain the necessary skills and knowledge based on the latest European standards to enable them to effectively carry out racking inspections. They will gain confidence through carrying out a supervised practical inspection during the two-days. This course can be delivered with a maximum of 6 delegates per course. We recommend a minimum of 2 delegates to ensure adequate cover on your site and this is reflected in our pricing structure. This course covers 5 modules highlighting all the essential aspects of pallet racking safety including the components, system types, common hazards and the relevant legal requirements. This is a one-day course with a mix of theory and practical. This course is aimed at responsible personnel within the warehouse environment and is ideal for both current and new employees as well as a refresher course for those who have previously completed the two-day damage inspection course. Suitable roles would include warehouse supervisors, team leaders etc. This course can be delivered with a maximum of 8 delegates per course. We recommend a minimum of 2 delegates to ensure adequate cover on your site and our prices reflect this. Our pricing structure means you only pay for the required number of delegates identified to undertake the course. This course covers 3 main sections legal requirements, damage to components and do’s and don’ts around pallet racking. This is a two-hour course with a mix of theory and practical. This course is for operatives who work within the warehouse environment and is ideal for both current and new employees. It is ideal to be used as part of new staff inductions to ensure new employees are aware of safety considerations when working within racking systems. Employees will gain a basic understanding of the consequences of damaged racking with a focus on the effective reporting of damage. They will take part in a pallet racking safety tour aimed at highlighting hazards within the structure and gain useful safety tips on working in and around the racking system. This course can be delivered with a maximum of 12 delegates per course meaning on larger sites up to 3 courses can be delivered per day. The course is split into 4 modules covering pallet racking and its components, the reasons why pallet racking must be inspected, how to conduct a racking inspection and common hazards faced with the warehouse environment. This course is aimed at the responsible personnel within the warehouse environment and is ideal for both current and new employees. It is designed to boost their safety knowledge and encourage safe working practices. Employees will gain an understanding of the consequences of damaged racking and why this must always be reported. They will take part in a pallet racking safety tour aimed at highlighting hazards within the structure and gain useful safety tips on working in and around the racking system. This course can be delivered with a maximum of 8 delegates per course. We recommend a minimum of 2 delegates to ensure adequate cover on your site.